Help to lose weight and reduce the fat absorption gradually by cleaning colon and detoxing the body. 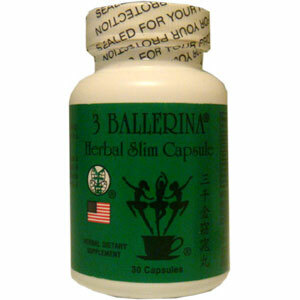 3 Ballerina Herbal Slim capsule is formulated with the highest quality of Senna Pods, Oriental Ginseng, Siberian Ginseng, Damjana Leaves Powder & MCC101 etc. These natural products help to lose weight and reduce the fat absorption gradually by cleaning colon and detoxing the body. As a supplement, take two capsules a day or as directed by a health care of professional. Do not use this tea if you have or develop diarrhea, loose stools or abdominal pain because Senna pods may worsen these conditions and be harmful to your health. Consumers are urged to consult a licensed physician prior to using this or any herbal supplement.